I’m privileged to have some fantastic friends. Some of whom I see and speak to regularly, others I may not see or hear from in years yet time and distance do little or nothing to diminish the richness of our relationship. Some I have known since we were children and others I have only recently met but the duration of our time as friends takes a back seat to the intimacy we share. Not all my friendships have lasted but I have come to appreciate that just as there are seasons of life, the same is also true for friendship. There is a poem that makes the rounds by email every so often and though its origins are uncertain, it succinctly captures this truth. There are lots of things in my life that I’m thankful for and friendship tops the list, coming in at a very close second to family. However there is one friendship I can boast of which meets and exceeds all three of the above mentioned categories. It is a friendship that defies the confines and limitations of time, space and distance. It is a friendship that models sacrifice, unconditional love, acceptance and self-disclosure. It is a friendship based on trust, honesty, understanding and compassion. It is a friendship that is unaffected by reciprocity for even when I’m not giving in this relationship, the other party doesn’t stop. The other party is God. I am a friend of God. Fancy that! “You, mere mortal, laying claims to a friendship with the Creator of the universe! How ambitious of you!” I hear you say. You wouldn’t be the first, even the angels expressed the same sentiment here.Yet I kid you not, it is true. I am so humbled that He befriended me in spite of my flaws, my imperfections, my struggles, my ineptitude. None of these things matter to Him. He loves me. “For God so greatly loved and dearly prized the world that He [even] gave up His only begotten (unique) Son, so that whoever believes in (trusts in, clings to, relies on) Him shall not perish (come to destruction, be lost) but have eternal (everlasting) life.” John 3:16 (AMP). What’s your RSVP going to be? Give Him a try. He just wants to be friends with you. While you study your invitation, here’s a song that reflects how I feel right now. Enjoy! Stella woke up with a start. She looked around the room and sighed. Oh my God! The same nightmare! When will it stop? She exhaled as her racing heartbeat slowed. Untangling herself from the covers, she made her way to the kitchen. She desperately needed a drink to steady her nerves. Where is the damned whisky when you need it? She muttered as she turned out the kitchen cupboards. She didn’t keep alcohol at home but she vaguely remembered hiding a small bottle of whisky after her last binge. That’s the trouble with hiding things in a safe place; you can never find it when you actually need it. “Ow! Ow!” She howled when she kicked the last cupboard door shut. “You really should be more careful” A voice said. Stella jumped, pressing her back into the kitchen cabinets behind her, hands on her chest. Her quick scan of the room didn’t reveal anyone else present. She gradually let out her breath which she’d been holding in and wiped the thin layer of perspiration on her forehead. She shook her head, trying to get rid of the cobwebs in it. She looked around the kitchen again, making sure she was alone then laughed out loud at how silly she’d been, imagining she’d heard someone speak when it could only have been her imagination. Now she really needed that drink! Perhaps in the absence of alcohol, a shower would clear her head and wake her up fully. She dressed in a polo neck jumper and a pair of worn denim and padded to the kitchen in search of something to quell her hunger. As she rummaged in the fridge for leftovers, her nostrils were assailed by the putrid smell of rotting flesh at the same time as she heard the same voice behind her. This time she knew she hadn’t just conjured it up in her imagination. Stella screamed as she turned around. At least she tried to scream but only a gurgling sound escaped her throat. She covered her nose hoping to stave off the wafts of putrefying flesh to no avail. It belonged to the creature standing in her kitchen. She gasped as she recognised him…her…no, it for this was no human. It was from her recurring nightmare. The one she’d been having since Vicky died. “Who…what are you? What do you want with me?” Stella asked. “You already know who I am. As for what I want with you, that’s a whole different ball game!” The creature replied. “Please go away. Leave me alone.” Stella’s voice was barely louder than a hoarse whisper as she backed into the hallway. Once out of the kitchen, she ran all the way to front door, barely stopping to grab her keys. She ran without looking back till she got to the park. She sat down on a bench, trying to get her breath back. She looked around. The park was full of people. People jogging; people walking their dogs; people talking and laughing; normal people. She would be safe here. She inhaled deeply and pondered on what had happened at her flat earlier. She couldn’t make sense of it. Was it all her imagination or had she really seen and heard that ‘thing’ from her dreams? Who could she talk to? Who would believe her? She hadn’t even brought her mobile phone with her as she had sprinted out of the flat. After she’d calmed down a bit, she sighed. She couldn’t possibly sit in the park all day! What would she do when night fell? I’m going home! She got up and trudged home, dreading what may be awaiting her in the flat. She opened the door slowly and sniffed. It smelled normal. She left the door ajar and stepped inside, sticking her head around each corner, checking her back to make sure there was no one but her in the flat. When she was satisfied she was alone, she shut and locked the door. She put the kettle on while she waited for her computer to boot up. She made a large mug of coffee and sat down at her desk. She typed ‘smelly apparition’ into the Google page and waited to see what would come up. “Aaaaaarrrrrrrrrrrrrgggggggggggggghhhhhhhhh!! !” Stella flew out of her chair, knocking her mug of coffee into her lap, as the ‘creature’s’ face filled her computer screen. She quickly pushed the on/off button and patted her scalding thighs. What on earth is going on? She opened the wardrobe door to get a towel to wipe her soaking clothes and there it was again. She jumped on to her bed, whimpering. “You didn’t think it would be that easy to get rid of me now, did you?” It asked. “Look, I don’t know who you are or what you want but you’ve got the wrong person. Please, please go away and leave me alone.” Stella said, shielding herself with her pillow. “Wha-what do you want from me? Stella asked. “You need to ask yourself what is it that you have laid claim to that isn’t actually yours? That’s what I want from you.” The creature responded. “I don’t know what you mean but please whatever it is, you can have it. Just don’t harm me.” She pleaded. “Plagiarising? What’s that got to do with anything?” Stella looked confused. “Ye-yes I d-d-did. She did” Stella answered, still unsure where this was leading. “And the said manuscript was written by …?” The creature asked. “I said I wrote it, I di…ow! Oh my God! My head! My head’s on fire! Make it stop, please make it stop!” Stelled howled, rolling on the bed, trying to get some relief from the burning in her head. “Just make it stop, I will tell you everything. Anything. Please, I’m dying!” Stella gasped as the pain stopped suddenly, tears rolling down her face. “Are you ready to tell me the truth now?” The creature asked. “I didn’t mean to be underhand or anything like that. Vicky told me she’d written a story and wanted me to look it over and give her my opinion regarding the plot, story development and characters. She said it was the first part of what would be a trilogy. She also asked me to take off my proof reading hat while reading. I read it and really enjoyed it. I thought she’d created an excellent piece of fiction and I told her as much. I also gave her a few pointers on how to make it read better. I told her I felt she should send it off to publishers as she stood a good chance of getting it published. I also offered to proof read and copy-edit it free of charge. She was very pleased with my offer and gave me the go-ahead to do it. Anyway I didn’t get round to doing anything with the manuscript for a whole year as I was busy with other things. Then I heard Macmillan, the publishing house, was looking for manuscripts from unpublished authors so I sent Vicky an email encouraging her to send it off. She was away from home at the time and didn’t have it with her so she asked me to email her a copy of the manuscript so she could forward it to them. I did. I didn’t hear from her for a couple of months. Then we exchanged a couple of texts in the New Year and I gathered she hadn’t got round to sending off the manuscript. She promised to call me to talk about it. The call never came. Then I got a text message from a friend in the States asking me to confirm if it was true that Vicky had died. I was stunned. I called her phone; it rang for a while then went to voicemail. Then I called a mutual friend and she confirmed that Vicky had been diagnosed with cancer a few months ago and had indeed died”. Stella stopped to wipe the tears that were rolling down her eyes and blow her nose. “I was grief-stricken. I couldn’t believe that my friend had been ill and I had no idea. I kept thinking of all the things I would have said and done if I’d had the chance. After the funeral, my life went on as normal. One day I was tidying up my computer and stumbled across Vicky’s manuscript. I re-read it and once again marvelled at how good it was. I then started to work on it, correcting errors and implementing the changes I had suggested to her. Then I did some research on literary agents, made a shortlist of five and sent the manuscript to them. Three weeks later, I got calls from three of them. They all wanted to represent me. I hadn’t clearly stated that I wasn’t the author. When I saw the raving reviews they all gave me, I decided it was best I didn’t let on about Vicky writing it. I agreed to go with Felicity Bryan and she pitched it to some publishers. That’s the call you were referring to when she told me how keen they were to publish it as they felt it would be a best-seller.” Stella couldn’t bear to look at the creature. “Well, you’re very lucky you came clean. You don’t even want to know what I was permitted to do to you had you carried on the charade. The headache was just the start!” The creature said. “I will tell Felicity everything. I don’t want anything to do with the book. I will give all the credit to Vicky. Please, just stay away and leave me in peace!” Stella had to wipe her eyes to see the creature as the tears blinded her temporarily. It was gone! Disappeared! Vanished! As suddenly as it had come, it had just gone. No puff of smoke. No melodramatics. Just gone! She knew what she must do. She looked at her phone. It was 4.45pm. She had to hurry. Felicity closed at 5pm. She scrolled to her contacts list, called up the agent’s number from Contacts and pressed dial. WEO, my older son, is on Easter holidays. So I’ve planned a series of activities to stave off boredom and consequently mischief. One of these was to visit Legoland and we went yesterday with some friends. The children had a really good time running around and on the various rides we were able to go on. EDU, my younger son, wasn’t able to go on some rides due to the minimum height restriction so we tried to do more of the ones he could go on. 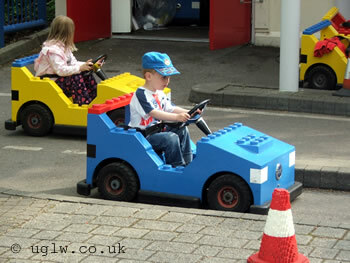 One of these was the Learner Drivers for 3 – 5 year olds. He’s not 3 till next month but that’s just a technicality so he did actually get to ride one of the cars. There was usually a queue for each ride and a sign to indicate an approximated wait time. For this ride, it was about 15 minutes. One of the ladies in our party had a one year old so she waited outside the fence while my other friend and I queued with four boys. It was going on 5pm as we queued and the creepy-crawlies had started to come out to play. We kept swatting them away and managed to keep them at bay, however one bumblebee flew quite close to EDU and wouldn’t go away. I tried to explain to her that EDU had previously been stung by a wasp, in his mouth no less so I was wary of the bee/wasp extended family. She was having none of it and was totally unmoved by my tale. To say that I was shocked would be putting it rather mildly. My friend was thoroughly disgusted. We both pondered on the matter for the remainder of our queuing time and couldn’t wait for it to end as we felt rather uncomfortable being around the ‘wounded’ party. We were even loathe to swat any more flying bugs which came our way thereafter so as not to cause further offence. I can understand and appreciate some people’s love of animals even though I don’t necessarily share it but I think there’s got to be a balance. This was not even the deep philosophical level of killing animals to eat but more of a protective issue especially since I’ve had a bad experience with a distant relative of aforementioned bumblebee. I’m not going to launch into an intellectual discourse about loving and protecting animals/insects at all costs as I would fail miserably to deliver a case for it. But I am going to reserve my right to defend myself and my loved ones against any creature that I fear may harm us even if it may upset someone else and I make no apologies for that. I’d rather a dead bumblebee than a stung and distressed human child. I found this exercise via the Outspoken Introvert and thought it interesting enough to do it myself. So here’s a little more about the Wordsmythe. Enjoy! Chore you hate: Ironing! Why can’t all fabrics simply be wash and wear? Instruments I play (or have played): Fiddled with a piano (no pun intended) and tried my hand at the drums. Overnight hospital stays: Two. First time having my first child, second time, undiagnosed swelling in leg. Yummy food you can make: How much time have you got? Zoo animal: I would probably love them a lot less if they were not in cages. I promised to blog at least once a week this year and I have managed to hit and even exceed that target most weeks. It’s a week exactly today since I posted anything so I’m overdue however I haven’t got anything to say. 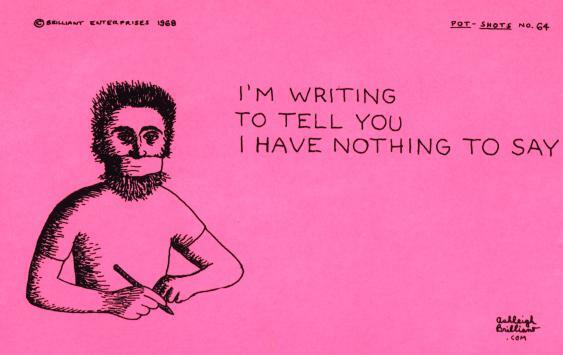 So I’m writing to let you know exactly that; I have nothing to say. Thankfully I find, I’m not alone. My friend and fellow blogger, The Globetrotting Executive is in exactly the same predicament. I think she expressed the condition so succinctly that I felt I should share it. So until the next time I have something worthwhile to say, here’s The Globetrotter’s confession. “Tari. Tari, wake up!” I jerked awake as Ade shook me vigorously. “What’s the matter?” I scrunched my eyes, lifting my hand to shield them from the brightness of the lights which Ade had turned on. “Didn’t you hear the banging? It sounds like someone is about to break down our front door.” He asked as he threw on some clothes, peering out the window to see who it might be. “I didn’t hear anything, I was fast asleep.” It was a wonder I’d managed to hear my babies cry for their middle-of-the-night feeds as I am such a deep sleeper. The thumping on the door was persistent and whoever it was wasn’t planning on leaving any time soon. “Come on, don’t just lie there. Let’s go and see who it is before they wake the children.” Ade said as he headed out of the bedroom. I looked at my phone and it was 4.30am. I shrugged into my dressing gown and followed him. Ade opened the door and there were a couple of police officers and some other individuals, two of whom produced ID cards and stated they were from the UK Visa and Immigration service. “Does a Mrs Adi…ronki Ibi…topi Oso…Ososanya live at this address?” One of the V&I officials asked Ade as he struggled to pronounce the name. “Mrs Aderonke Ibitope Oshosanya is my mother who’s visiting us, yes.” Ade replied looking puzzled. “Is she home? May we see her?” asked the second official. “Might I ask what you want with her? She’s my mother.” I could see Ade was getting a bit defensive. I couldn’t help the smile that spread across my face as I walked up the stairs but I rearranged my features into a slightly troubled look as I knocked on the guest room door and called out to Mama, keeping my voice low so as not to wake the children. “Ehen! What’s the matter?” Mama said from inside the room. “Which people is that? At this time of the morning?” Mama was not usually one for subject-verb agreement especially not when she’d just been woken up by her least favourite person. “Mama, I don’t know but they are adamant they must see you. Ade is with them at the moment.” I replied, feigning ignorance. I waited on the landing for a few minutes till Mama finally made an appearance with a chewing stick in her mouth. I let her go down the stairs first. As we entered the living room, everyone was standing. The silence was deafening. I broke it. “Ehn! What are you saying? Ah! Iro leshu pa! The devil is a liar oh!” The chewing stick fell out of her mouth. Mama pulled the scarf off her head and threw her hands up in the air as if in supplication. As one of the police officers moved towards Mama with a pair of handcuffs, Ade stepped in front of Mama. “Wait a minute, officer, there’s been a mix-up. This is a misunderstanding.” He had to raise his voice over Mama’s as she’d started to wail. “Sir, please move or I’ll have to arrest you for obstruction of justice and aiding and abetting a criminal. “Me? A criminal? Ye pa! Mo gbe o! Oh, I’m dead! I’m finished!” Mama sobbed as she held on to Ade. “Don’t worry, Mama. We’ll have this all straightened out soon. Please stop crying.” Ade tried to console her as the police officer cuffed and led her away. I had to run upstairs to pick up the baby who was now crying having been woken up by the commotion downstairs so I missed seeing Mama being taken away. I came downstairs with the baby to find Ade on the phone to a lawyer friend of his. From his side of the conversation, I could make out that his friend asked him if he knew where Mama was being taken and if the officials had said exactly what they intended to do to her. Ade replied in the negative. He got off the phone after a few minutes. “What did he say? What do we need to do?” I asked. “Are you sure we shouldn’t wait till you speak to the immigration officers first? They might be willing to extend her visa and let her stay on.” I said, trying to calm my agitated husband. As Ade left, I smiled into my baby’s shoulder and did a little jig around the room. I inhaled the sweet air of victory. Ha! Revenge is a dish best served cold, I thought. That’ll teach Mama never to mess with me again! Where would we all be without our precious mothers? May God bless our wonderful mothers. Sometimes we don’t do things we’d love to do for fear of failure. The very thought of not succeeding or reaching a desired outcome cripples us and holds us back from doing things. We teach our children to avoid failure too. We say to them “Don’t climb, you’ll fall.” “Don’t run, .” “Don’t touch it, bump into something you’ll hurt yourself.” It’s always one cautionary tale or another so we are raising a generation of people who will not even dare to dream, much less try. Please don’t misunderstand me as I’m not advocating we let our children run riot. What we fail to understand (pardon the pun) is that failure sets us up nicely for success. Our ability and willingness to recognise failure for what it is sets us in good stead to apply ourselves to success. It is instructive to realise that failure doesn’t make a person. We must learn to separate our person from the event that is failure. The fact that you failed at something doesn’t necessarily make you a failure and the sooner we come to terms with this, the sooner we’ll work towards accomplishing some of those erstwhile seemingly unachievable goals. Things left undone for fear of failure are the stuff regrets are made of. There are so many things we will be unable to accomplish in our lifetime but that shouldn’t stop us from trying. We can dream big even if there’s no chance of it coming true, after all dreams are free! Let’s turn failure around in our favour. Instead of fearing to fail, let’s fail to fear. Let’s look fear straight in the eye and defy it to stop us from attempting to do things we’ve always dreamed of doing. Sometimes the things that look insurmountable before we start pale into insignificance along the way. It’s time to cut ourselves some slack. It’s time to permit ourselves to fail as long as we don’t let that become our last attempt at doing something. It’s time to assert our fundamental human right to fail. We need to give ourselves permission to make mistakes thereby learn more ways not to do something. Think about where modern civilisation would be if people of old had given up or not tried at all for fear of failing. Had Thomas Edison not persisted 10,000 times we wouldn’t have had the light bulb today. If Colonel Sanders had given up, there would be no KFC chain. If Alexander Graham Bell had not steadfastly applied himself to his research, the telephone may not have been invented. What have you been holding out on doing because you worry you won’t succeed? Whatever it is, start today. Start small but start anyway. I’ll leave you with a quote which succinctly captures all I’ve been trying to say in this post.